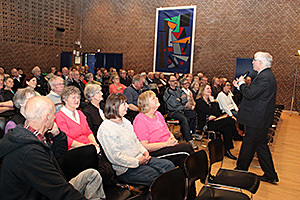 FULL CONGREGATION: The hall was almost packed when Svein-Magne Pedersen met up in Billund. About ten people sought salvation, and many were touched by the power of God. On Saturday February 22 this year Svein-Magne Pedersen visited Billund in Denmark for the third time in less than two years. Ten people sought salvation, and several were met by God's healing power. Many were in Billund center next to Legoland when Svein-Magne Pedersen had his third miracle weekend in Denmark. The first time he visited Billund in September 2012, and the second weekend meeting was held in February 2013. There were great expectations for the meeting, and the Christian newspaper "Utfordringen" (The Challenge) had written a pre issue about the meeting and printed a testimony of healing. Our Danish friends came from all over the country to hear Pedersen preach and to receive prayer for their ailments. The meeting hall was almost full, and the atmosphere was great from the start. The organizers offered familiar hymns, well accompanied by a group of older musicians from Bethany Church. The group members used instruments such as harmonica, banjo, bass and saw. Around ten people came forward to receive salvation. All were recorded for further follow-up. About 35 people sought salvation in Pedersen's visits in the past two years. Karl Heinz Peters from Nordborg had for years struggled with an inflammation of the teeth, called periodontitis. The gums were sore and swollen, and his teeth were constantly bleeding and loosening. The disease had evolved so drastically that oral surgery was planned, but Peter would rather rely on Jesus the dentist fixing the problem. -When Pedersen prayed, I felt a tremendous heat, and the teeth were almost anesthetized. Now I have no pain, and the teeth have not loosened recently. -It is better to go to Jesus than the dentist, Peters says wisely. Peters also experienced getting healed for inguinal hernia and osteoarthritis when Pedersen visited Billund in February last year. The doctor wanted to operate the hernia, but Peter wanted only local anesthesia because he wanted to keep a close eye on what the doctor was doing. The doctor did not allow this, thus no surgery. Instead Peter placed the surgery knife into the hands of God. -The best thing you can do with your ailments is to seek the man upstairs. Hanne Petersen from Skjern, Denmark had sprained her ankle five years ago. In the years after it had not healed completely, and it constantly locked tightly. It was very painful and it was difficult to walk. Since Petersen had a job in the cleaning industry, her work became a challenge. In addition, she had arthritis that led to her taking an early retirement. -When Pedersen prayed, I felt a warmth that went through me, and then my foot was healed. I could run back and forth without pain, something I have not been able to do before. In the time after, I have been fully active. I have bicycled, gone hiking and done water gymnastics, she says excitedly. Another who was very happy was Evan Pedersen from Vodskov. For eight years he had been completely deaf in one ear, probably because of diabetes, but the doctor had not really figured it out. -When I was in large gatherings, there were echoing sounds in my head, which was very uncomfortable, so I had to go outside. When I talked to people, I had to concentrate. When Pedersen prayed, I felt a pounding in my ear. After the prayer, I got some of my hearing back, he says. Several others had experienced God's healing power and people with neck pain, wear and tear of the knee, gout, as well as poor eyesight and hearing testified that something had happened. The meeting lasted into the evening, and after eleven hours had gone by the last happy people went home. Erik Lundsgaard Madsen from Billund was one of the initiators of the meeting. He has previously testified in the magazine «Healing» and on the television program "The Miracle is Yours" about how Jesus healed him at the Miracle Saturday meeting in April 2012. For years he struggled with a whiplash injury, which had cost him both marriage, job and lots of money. After four visits to Vennesla, he was healed. The last two years Lundsgaard Madsen has helped arrange meetings with Pedersen in Denmark together with Irene Madsen, who is originally from Norway. -It was a powerful meeting and very nice to see so many get saved and healed. I'm so happy about everyone who showed up. The number of attendees increases more and more for every meeting we organize with Pedersen. It shows that people are enjoying themselves and that they yearn for healing. The feedback from people is good. People like the way the meetings are set up, Svein-Magne Pedersen lays his hands on all those who want to receive prayer and he prays for each and every one. We hope to arrange another meeting soon, says Erik Lundsgaard Madsen happily.